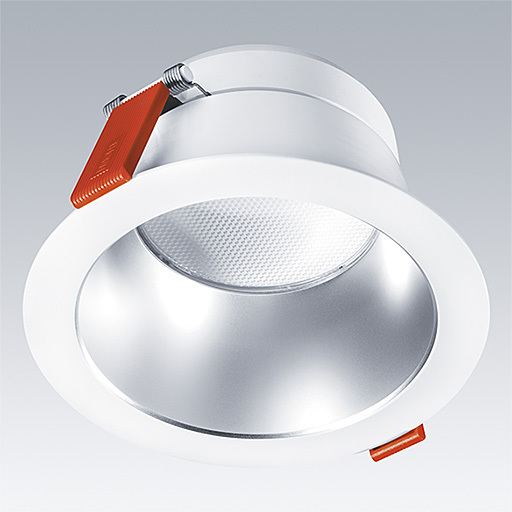 A recessed LED downlight. Remote fixed output control gear with 3 hour, Self/Addressable test, emergency lighting circuit. IP54 (IP20 from above), Class I electrical, UGR<19. Body: aluminium, painted white (RAL 9016). Reflector: satinbrite. Suitable for mounting in ceiling thicknesses of 1-40mm in a Ø150mm cut-out. Complete with 3000K LED.